Did you know that Europe had recently gained a new startup accelerator? Shortlisted by Telefónica’s program Wayra in July, ten Spanish startups have been quietly working from the recently inaugurated Wayra Academy in Madrid, which we had a chance to visit this week, alongside an entrepreneurial delegation from the UK. As you may remember, we first mentioned Wayra last July, when it launched in Colombia during the Campus Party in Bogotá. At the time, thirty startups were shortlisted for a chance to become one of the ten projects that Telefónica’s new accelerator would boost. Since then, the operation has been repeated in several Latin American countries, including Mexico, which has recently inaugurated its own Wayra Academy. This is one of Wayra’s specificities: besides seed capital, it also provides startups with well-designed co-working spaces, the Wayra Academies. While they are located in different countries, they look exactly the same – a reflection of Wayra’s global brand strategy. 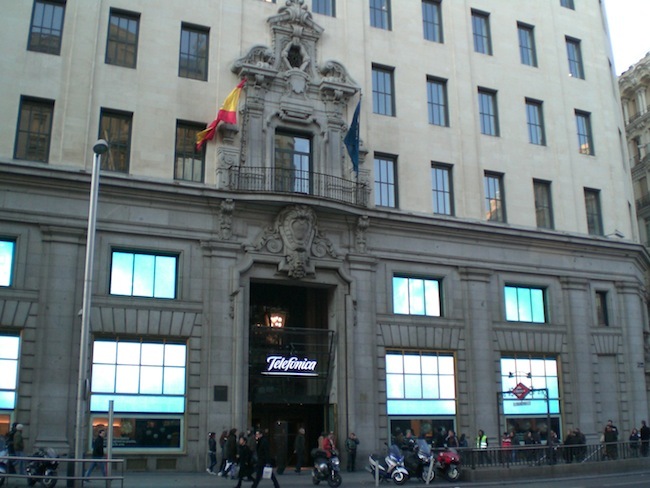 In Madrid, Wayra occupies one floor of Telefónica’s historical building on the famous Gran Via. This is highly symbolic, as most of the telco’s local employees are now based in its new peripheral campus, the gigantic project Distrito C.
As a matter of fact, one of Wayra’s main purposes is to help Telefónica to innovate and keep up with digital trends. While it also invests in internal innovation, working together with entrepreneurs is a great way to cover more ground and transform the company, Martín-Villa says. This need for synergies is the reason why Wayra only accepts projects that are related to Telefónica’s core area of expertise – ICTs. Each team will then receive support and mentoring from Telefónica’s most relevant internal department. Besides Telefónica executives, the startups also receive individual support from other mentors, such as entrepreneurs and investors. According to Gary Stewart, Director of Wayra Academy in Madrid, these mentors are handpicked to make sure they can really help each team. For instance, if Telefónica selects an e-commerce project, it will approach an experienced e-commerce entrepreneur and ask them to mentor the team. The program also includes training, from lean startup methodology to pitch rehearsal. The investment seems quite high compared to other acceleration programs; “the teams will fly to Silicon Valley to expand their network and vision, Stewart said – not to mention the co-working space that hosts them. Clipyoo is a marketplace for high-quality video clips filmed by a professional TV crew which didn’t need those rushes, and that another station could use for a different show. Coquétame wants to democratize personal shopping thanks to technology. Its users will be able to get personal fashion and style help at no cost – the platform will be monetized through e-commerce and partnerships with brands. Emtrics uses QR codes to give access to surveys, through which customers can share feedback before they leave the point of sale. The startup hopes to monetize it by charging brands, and is already testing its system with twenty companies in Madrid, including NH Hoteles, Telefónica and Muji. Evomote is a second-screen app. Besides turning your smartphone into a remote control, it will also let you chat with your friends and find TV programs you may like. Impoks wants to disintermediate finance, and its portal lets individual investors easily manage their portfolio. It is also social, and users will be able to identify a talented digital investor and mirror its portfolio trade by trade. Mira! Musei’s team is developing a smartphone app to enhance the museum visitor experience, by giving museums and visitors a chance to interact. Scheduled to launch in March, it will include routes and other suggestions, while taking account the visitor’s preferences and profiles. Mirubee wants to give its users a X-ray of their energy consumption so they can start saving energy – and money. Thanks to a small piece of hardware, Mirubee will receive detailed data and tell customers what each of their appliances consume. Sezion’s ambition is to help amateur musicians create music together – even if they live in different places. Its iOS app will let musicians create and share their work with like-minded people. TedCas jokingly calls itself a ‘Minority Report for doctors’; while keyboards and mouses can be infection vectors, TedCas uses Kinect motion-based approach to help prevent nosocomial infections. Already in test in one hospital, TedCas’ technology could appeal to emerging markets. Valioo describes itself as a fair marketplace for personal data. Small companies are often eager to get customer reviews, which customers are reluctant to give. Valioo’s model gives users an incentive to share their opinion: if they do, 100% of the money will go to their favorite charity (Valioo will only monetize additional services it offers to companies). Each company had a few minutes to pitch their projects to the British delegation, which included investors such as Alex Macpherson from Octopus Investments and Julie Meyer from Ariadne Capital. Despite teething problems with pitching in English, an exercise for which founders will start training next week, the general feedback was very positive. Talking about personal favorites, the names that came back most often were Impok, TedCas and Emtrics. Beyond good ideas, participants were also impressed by the founders’ experience. Some entrepreneurs have worked at Telefónica for years, and others have already worked on similar startups before launching their latest project. It remains to be seen which teams will progress the most over the next months, but one thing is for sure: the upcoming Demo Day will be worth attending.